The energies have been interesting in terms of the Chinese curse: may you live in interesting times. I have experienced and heard from others that there seem to be waves of "difficult at times" energy that can feel chaotic in one moment and in the next can be replaced with dread or joy. In myself, I found a need to clear some stones, change to more grounding energies such as rhodonite and malachite. It calmed my heart and allowed the energies to pass more easily. So, we highlight these old standbys for the newsletter. Melody, Love is in the Earth, 1995: Rhodonite crystallizes in the form of masses, grains, and tabular crystals. Sometimes, it has rounded edges. The color rangers from pink to rose-red to brown-red, green, yellow and black. It is usually veined with black manganese oxide. It has been found in druses and in a lovely gemmy combination with Bustamite. It can assist in the attainment of one's "greatest potential", dispelling anxiety and promoting coherence during chaotic encounter. It further assists one in recognizing and in implementing the actions required to encourage and to further the "brotherhood" of humanity, stimulating the serving aspects of one's nature and encouraging generosity of spirit. It helps one to understand that each individual possesses a relationship to a structure of meaning which can be fulfilled. The gemmy Brazilian Rhodonite has been found to act in an immediate fashion to activate the pineal gland and to release a dominant and influential energy to stimulate intuitive guidance. It has been known to facilitate an impenetrable energy which stimulates alignment of chakras and removal of blockages. It is one of the "great formations" in combination with bustamite. It dispels anxiety and promotes coherence, bringing to the user an observant nature and facilitating attention to details and interrelationships. It has been used in the treatment of emphysema. It can also be used in the treatment of inflammation of the joints, light sensitivity, streptococcal throat infections, heart disorders, and arthritis. Michael's Gemstone Dictionary, 1990: For feeling, as well as projecting, an aura of elegance. Spiritually, it helps one to forgive and thereby brings about reconciliation between people who have been hurting each other for some time. It helps us realize that strife is very often caused by a lack of self-love, and that the triggering 'misdeeds' of the other person are not the real cause. This facilitates mutual understanding, strengthens friendships, and helps solve conflicts in a constructive manner. 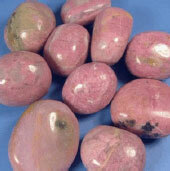 Rhodonite stimulates learning from life and bestows spiritual maturity. Mentally, rhodonite makes it possible to remain clear and conscious even in extremes situations, when in danger, when threatened or under great pressure. It helps us to understand that revenge has a mainly self-destructive effect and makes it easier to deal calmly with provocation and insults and to remain prudent and level-headed in all our actions. It elucidates the meaning or gain in any experience even if it is unpleasant, thus showing the way out of seemingly hopeless situations. Physically, it is the best wound-healing stone of all. Minor injuries like small cuts will heal in a matter of minutes. It heals suppurating wounds, helps eliminate toxins from the tissues and makes sure that healthy tissue without scar tissue is formed during the healing of the wound. To a lesser degree it will transform already healed scars. Rhodonite will heal internal injuries and stimulate regeneration during illnesses that involve processes of self-dissolution, for example, autoimmune diseases, stomach ulcers, even multiple sclerosis. It strengthens the heart and circulation and encourages fertility in both sexes. Melody, Love is in the Earth, 1995: It is the "stone of transformation". It assists in changing situations and provides for the transfer of sacred information leading to spiritual evolution. It assists in clearing and activating all chakras and is quite helpful in stimulating the heart and throat chakras. It is an excellent stone for clarifying the emotions and for allowing both the recognition and the release of negative experiences which one cannot recall; in the rebirthing situation, it provides for ease of disposal of opposing encounters. It can be used to facilitate insight concerning the cause of any specific condition; e.g., to providing insight to the basic disorders within the body, mind, and spirit, and to the conditions associated with the interaction with others in this reality. It is an equalizing and balancing agent. It can create an unobstructed path leading to the desired goal. It also provides for an indication of the procedural steps required to attain a chosen end-result. It helps one to accept responsibility for one's actions, circumstances, and actuality, bringing understanding and intuitive answers to the forefront prior to response and subsequent action. It stimulates instinctive and intuitive reasoning, allowing for change which facilitates advancement. It represents fidelity in love and friendship, loyalty in partnerships, and practicality and responsibility in business transactions. It has been used as a protective stone by those involved in the field of aviation and is said to dispel symptoms of and to stimulate awareness of the inner bases for the condition of vertigo. Drusy Structures are especially energetic in facilitating both the rise of spirituality and the enhancement of psychic abilities. The stalactite form encourages progression toward the spiral of infinite wisdom, while providing strength for the journey. This mineral can help one to look deep within the self and to acknowledge the reasons supporting an illness, further guiding and supporting one in release of the emotional causative factors. It is said to protect against radiation and can be used in the treatment of asthma, arthritis, swollen joints, tumors, growths, broken bones, and torn muscles. It can be used to regulate RNA/DNA structures, to align and cleanse the cellular structure, to enhance the immune system, and to ease the birth process. Michael's Gemstone Dictionary: Enables one to stay in a mood of loving tolerance toward others, balanced internally and able to respond flexibly to events, regardless of what is happening no matter how bizarre and unsettling the events. One is able to be truly appropriate in one's actions. Makes one feel very willing to communicate who one is and where one is coming from. Promotes a willingness to relate to others and let them know who one truly is. Stabilizes one's energy level, and allows one to move at a steady, comfortable pace through the day. It balances and heals all chakras. One of the most powerful balancing stones. It is almost impossible to be around malachite for long, and remain unbalanced. Spiritually, Malachite encourages an appreciation of aesthetics, sensuality and beauty, friendship and justice. It helps us imagine ourselves in the position of others and to empathize with them (sense their thoughts and feelings). Malachite gets rid of shyness and awakens the desire for knowledge. Life is experienced more intensely and is more adventurous. Inspired by malachite, we learn to love risk and to rely on luck. Malachite helps make us more aware; desires, needs and ideals become visible but the realization of them remains up to us. 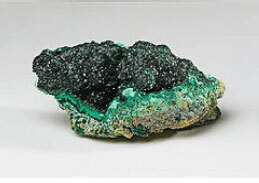 Emotionally, malachite stimulates inner imagery. Dreams, imaginations, and memories become alive and real. Suppressed feelings are suddenly brought out into the open. Malachite takes away inhibitions and encourages the expression of feelings. Moods are experienced more intensely and then rapidly dropped again as fast as they arose. Old pain and traumas may surface and be dissolved if we are in a position to face them. This is one of the weaknesses of malachite: it makes many things conscious but does not support much with changing what it has given us as an insight. Mentally, malachite strengthens the understanding of concepts. We are in a position to absorb information more quickly as the imagination makes us strong and aware of how to handle it. Thoughts flow very fast and decisions are made without having to think a great deal. Malachite fortifies the capacity to observe; even tiny things are perceived much more rapidly and their meaning is recognized. This also increases the ability and willingness to criticize and confront. Physically, malachite dissolves cramps. It helps with menstruation and facilitates labor. It encourages the development of the female sexual organs and heals their ailments. It also helps with sexual problems, particularly if bad experiences were the cause. Malachite stimulates liver activity, has a detoxifying effect, alleviates rheumatism and helps reduce acidification of the tissues. It stimulates nerve and brain activity.